Spectacular ocean view. 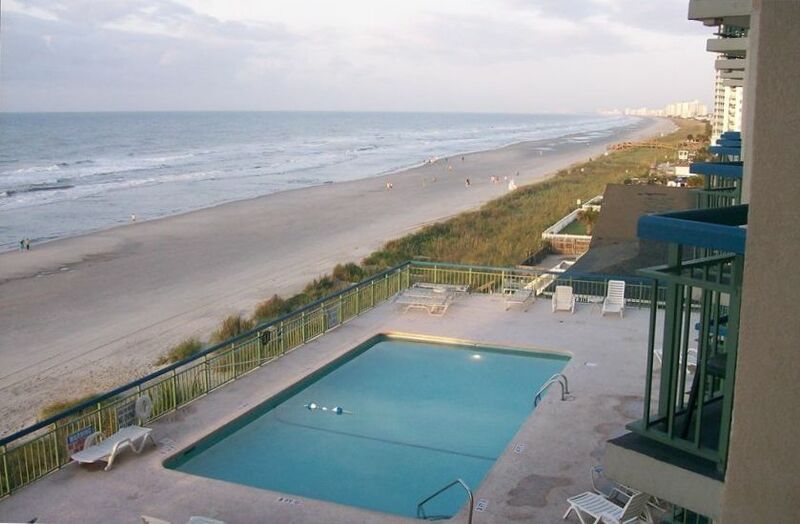 Great oceanfront location in the Cherry Grove section of North Myrtle Beach. Close to the Cherry Grove Pier. Cherry Grove is a low key beach community with good proximity to all Grand Strand Amenities. Several restaurants within walking distance. Just two miles north of Main Street. Easy access to Myrtle Beach attraction via short drive to Hwy 17. THE OCEANS is a medium size eleven story oceanfront building of less than 100 units. Parking is more than adequate with three levels of covered garage parking. There are eight levels of individually owned condominium units. First three levels are garage parking. Levels four through eleven are residential condominiums. My unit is on the sixth floor which allows for a wonderful ocean view. Access into the building is secured by keyed entry. Two elevators serve the residential units. Oceanfront swimming pool and laundry facilities are on the fourth floor. The Oceans offers a oceanfront pool, community room and on site laundry facilities. WIFI is available on site. The Oceans has the largest one bedroom units in Cherry Grove Beach. My condominium is a large (800+ SF) one bedroom/1.5 bath unit. The bed is king size. There is no "pull out" sleeping facilities and occupancy is limited to two adults. There is a full bath with a half bath dressing area attached. The living room/dining room is spacious with lovely view of the ocean. The unit has a completely stocked full kitchen. Condition of the unit is very good. The condo has wood floors (except for the bedroom) and is tastefully decorated with good quality furnishings. The balcony has several rocking chairs for your relaxing enjoyment. The unit is conveniently located just a few steps off the elevator. There is a grocery store within a block so just park your car and walk. Sorry - Pets are prohibited by Homeowner Association Bylaws. Homeowners Association has authority to evict if a animal is brought onto the property. This is strictly enforced. There is no smoking allowed in the unit or on the property (per HOA bylaws). I live in the Charlotte Metropolian Area just a few hours drive from Cherry Grove. Vacationed in Cherry Grove for several years before deciding to buy at The Oceans. Can't beat the location. All the peace and quiet of a low key beach atmosphere but allows for quick access to Hwy 17 and all the local attractions. Can walk to the grocery store which is a block away. Fishing pier within walking distance also. Bought my condo because it is just a few hours drive from my home. Within hours of leaving home I can be enjoying the wonderful ocean views. Conveniently located in the quiet Cherry Grove Section of North Myrtle Beach. Just a few miles north of Main Street in North Myrtle Beach. Close to Cherry Grove Pier. Walking distance to Boulineaus's Grocery Store, Post Office, the Pier, bike rentals and several small restaurants. Covered garage parking, ocean front pool and secure keyed entry into the building. In fourth floor laundry room. More than adequate garage space in three level garage. The condo was very nice and exceptionally clean. We had a great time and enjoyed the coziness of the condo. As always nice clean condo. loved our stay. Loved the pool being next to the ocean. Grocery and Dairy Hut were a plus also. Your condo was perfect for us. Hope to come back next year. We are smokers but always observed not smoking except at designated area. There were quite a few people who smoked at the pool and even by the elevators though which I thought was very inconsiderate. No problem for us though. I would definately recommend your condo to anyone. Accommodations are nice. Great location and oceanfront view. Owner is easy to work with. We would definitely book again. We were so pleased with our stay. This condo had everything we needed; infact we did not use the rental car for the first 3 days. Large grocery store across the street with deli, salad bar, Bakery and more. Duffy’s seafood restaurant with in walking distance. Beachfront so close you can hear the waves in the living room. And did I mention a balcony that is covered and the perfect spot to have morning coffee or spend a rainy afternoon with a book. We hope to return.. we are in love with the condo and the area. On line bookings are assessed a separate 8% Service Fee which is payable to VRBO at time of using their on line booking service. You will see this as a Service Fee at time of check out. Phone conversation with owner to assess suitability of the unit for renter's needs prior to final confirmation. Owner 704-819-7594.